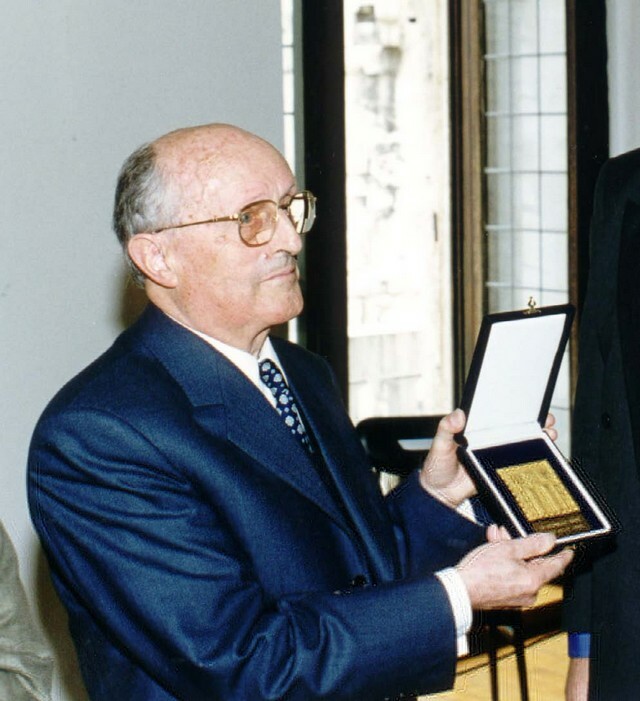 Dr. Charles Béné (1919-2005), distinguished French scholar, expert in the Croatian Renaissance literature (on the left), receiving the INA Award for international promotion of Croatian culture from Ivan Đerek, president of the Jury, Zagreb 1994. Dr. Charles Béné (1919-2005), a retired professor from the University of Grenoble, is a European authority on 16th century literature, in particular Christian and Humanistic literature. In this filed he has published about eighty books and studies. He has earned renown mainly through his works on Rabelaise, Montaigne and Erasmo of Rotterdam. Recently, he has placed Marko MARULIĆ on par with these world-famous classics, dedicating a major academic effort to the studying of his work. 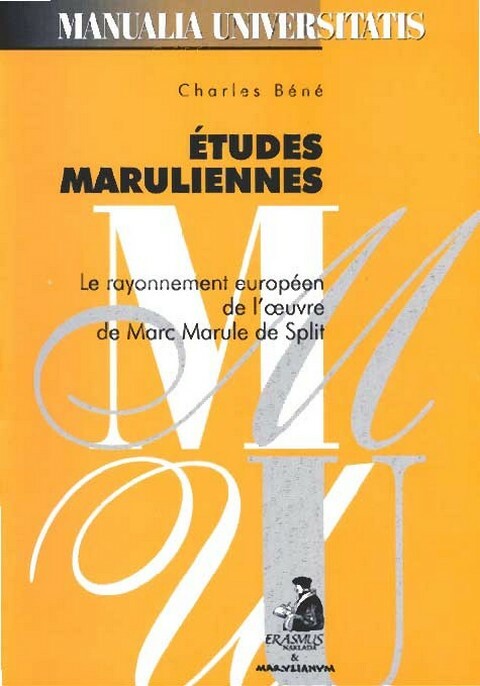 At international conferences in Saint-Etienne, Fribourg, Clermont-Ferrand, Copenhagen, Lody and Grenoble, professor Béné discussed various aspects of Marulić's literary works, and his discourses were published in distinguished European magazines. He has also studied other Croatian writers of the Humanism and Renaissance movements: Juraj ŠIŽGORIĆ, Marin DRŽIĆ and Matija VLAČIĆ. 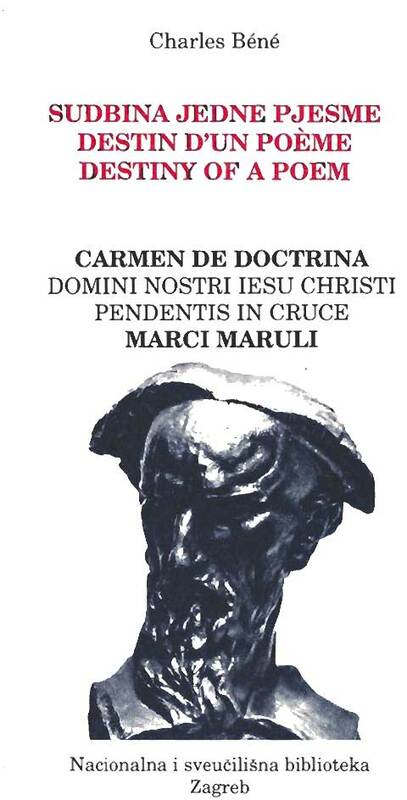 He wrote a monogaph on the Marulić's Latin poem, "Carmen de doctrina Domini Nostri Iesu Christi pendentis in cruce", which was published in a trilingual version by the National University Library of Zagreb and the "Književni krug" of Split (Zagreb 1994), in which he presented the global value of Marulić's text and broadened the perceptions regarding the father of Croatian literature. Professor Béné was encouraged, in particular, by the success which the books of Marulić have encountered throughout Europe, and his recent research corraborates his thesis that this humanistic scholar from Split should be classified as a classic of global spritual literature. 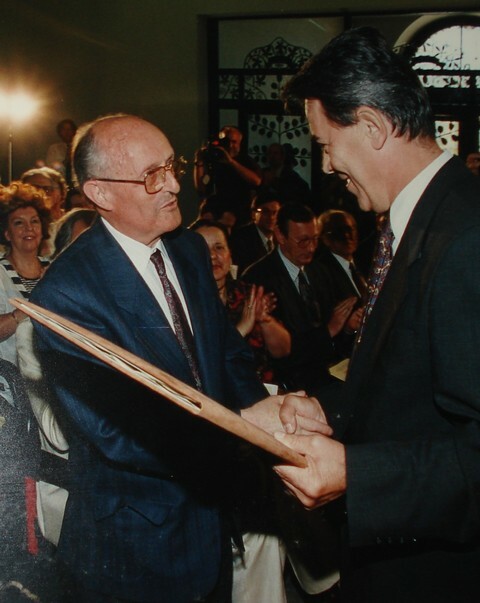 He promotes this thesis with success in European academic circles, indicating simultaneously that the Croatian contribution to the European humanistic movement should be appreciated. Professor Béné, whom Croatian friends lovingly call Dragec Benić, is moreover an altruistic friend of Croatia, its culture and history, which he clearly proved over the period of the war through his intercession in favor of truth and justice. Since 2002 Professor Charles Béné was elected a member correspondent of the Croatian Academy of Arts and Science. He was honorary member of the Croatian Society of Literary Translators, and obtained special recognition from the Split Literary Circle. Marko Marulić, l'Europe et l'Angleterre. Béné, Charles. Essais sur le Discours de l'Europe éclatée, 11, 1993, p. 55-69. 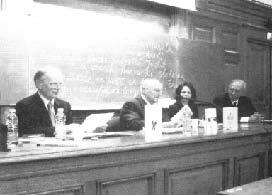 Presentation of Charles Béné's translation of Marulić's Judith into French, Sorbonne, Paris, in 2005. From the left: Henrik Heger (professor at Sorbonne and president of Almae Matric Croatiacae in Paris), Charles Béné, Cvijeta Pavlović and Mirko Tomasović. Charles Béné, un marulologue exemplaire, here with the acknowledgement - Golden Coat of Arms of the City of Split, Croatia. 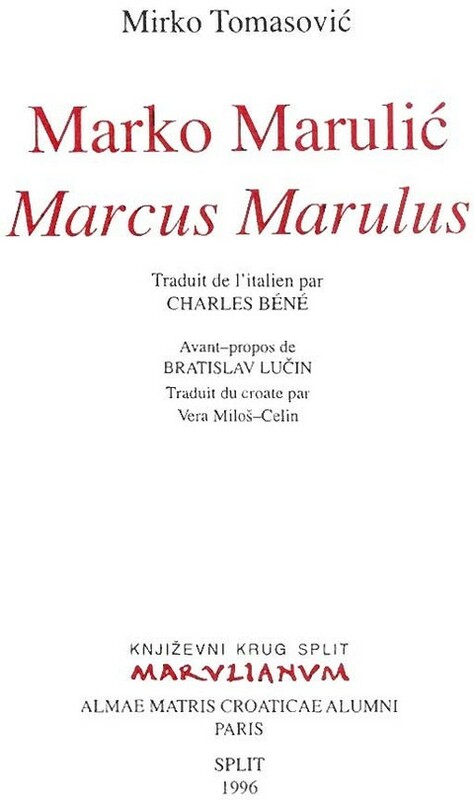 Destiny of a Poem, a monograph by Charles Béné dealing with Marko Marulić. Another monograph by Charles Béné published in French. 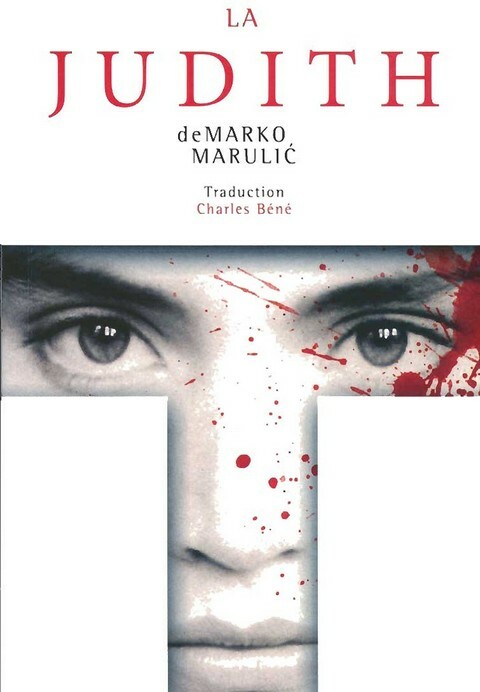 Charles Béné translated Marko Marulić's Judith from Croatian into French. Charles Béné translated an important book by Mirko Tomasović from its Italian translation into French. Many thanks to Mrs. Vesna Bućan, secretary of the Croatian Cultural Club in Zagreb, for her kind help. Also many thanks to professors Bratislav Lučin and Branko Jozić from Književni krug Split, Marulianum, for their generous help.